Sugar High Friday #21 – Ice, Ice Baby! It’s time again for one of my favorite food blog events, Hay Hay It’s Donna Day!. For those not in the loop, its a foodblogger homage to Donna Hay, a brilliant food stylist and recipe developer from Australia. She’s the Martha Stewart of Down Under without being outwardly nutty. 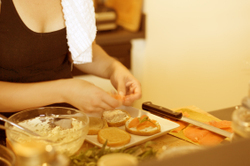 Our theme this time, determined and hosted by Bron Marshall, is Bruschetta and Crostini. Let’s face it. 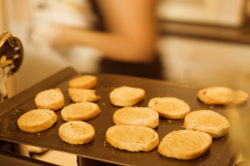 There is very little in the world that doesn’t taste better with a piece of fresh, crusty bread with it. Bruschetta allows you to use it as a vehicle for an endless number of amazing toppings and combinations. I wanted to try one savory and one sweet version. When the mere mention of this endeavor garnered an "OOoooOooh" from my good friend Tony Clark, I took my cooking adventure on the road to his studio. I said the words "smoked salmon" and – suddenly – I heard a wine cork pop and Tony had his camera in hand. Obviously, the quality of bread used here is important. I would also stress that using good quality olive oil to drizzle/brush on is key. It adds a lot…even if you’re going to cover it up with a heap of toppings. 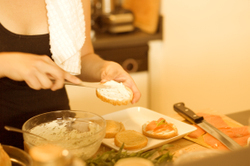 The goat cheese mixture in this recipe – Smoked Salmon, Fennel, and Goat Cheese Toast – is so incredibly flavorful. I added garlic and extra lemon juice to the mixture. The lemon juice also helped thin the mixture a bit and make it easier for spreading. Smoked salmon is like bacon. It makes everything instantly good – or better. Topped with a little bit of fresh tarragon, 12 or so pieces of this bruschetta and a bottle of white wine was devoured in about 9.5 minutes. Need I say more? For the dessert portion of Donna Day, I was left to my own devices…as you can tell by the photo. No action shots this time as its just a bloody miracle I’m able to cook and take a photo of stuff before it falls to pieces. 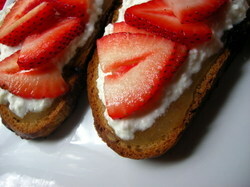 I found a Donna Hay recipe for Bruschetta with Honey Ricotta and Strawberries on Food and Wine’s website. This could be my ideal dessert: sweet but not too sweet, fruity and bready at the same time. It also left lots of room for improvisation. I used an apple walnut raisin bread as the base for my version. I brushed it with butter and toasted it a few minutes on each side (be careful here of over-toasting and burning the fruit in your bread). Rather than mix the honey into the ricotta, I spread a 1/2 teaspoon or so of Italian orange honey on each piece. Next went on the ricotta, which was held nicely in place by the honey. The fruit went on last. You could substitute whatever kind of fruit you had on hand…but I will say that the flavor combination here was absolutely divine. It’s a perfect light summer dessert (or breakfast!) and would be a great recipe to make in large batches for entertaining as a unique dessert finger food. 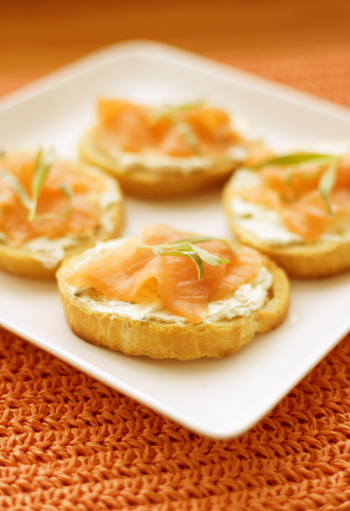 You can find the original recipe for Smoked Salmon, Fennel, and Goat Cheese Toasts here at Epicurious.com. 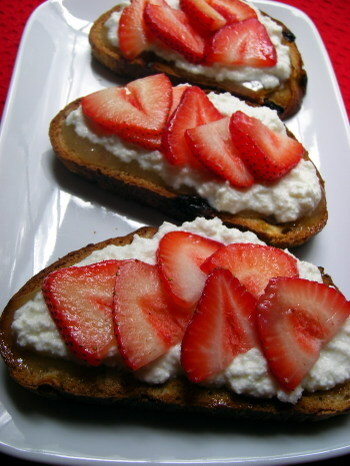 For the original recipe for Bruschetta with Honey Ricotta and Strawberries, go here at Food And Wine. Thanks to Tony Clark for the action shots and the gorgeous salmon photo at the top. Blame Tami Hardeman for the strawberry bruschetta shot. Mmmm Tami these are perfectly gorgeous! Smoked salmon and strawberries just scream champagne and romance, beautiful! Wishing I could devour them for my breakfast this morning. That´s very inspiring. I´m going to take part in this too. My first blog event, let´s see how I do. Yummmy, yeah, I love smoked salmon also! So good. Lovely bruschetta of yours! I love the combination of flavors. Very much my kind of food! Love the ricotta and really like the idea of using honey. They are both fabulous! Love the action shots telling the story. hi there. great site. I added your blog as a link on mine. Happy blogging! Thanks for participating Tami in the event. I love the sound of both combinations. I stumbled across your blog while I was in the process of doing some online research. I’m with you! I think everything tastes better paired with crusty, fresh bread! Of course, I think crusty, fresh bread tastes great by itself as well!